It is given to “bloggers who positively and creatively inspire others in the blogosphere.” Thank you so much to Arjuna. The Nominees . 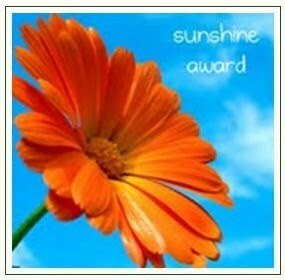 I encourage you to visit and discover on your own how they deserve The Sunshine Award because they all positively and creatively inspire. Also some (or all) of these writers may choose to not participate in this award process but I still want this chance to help you, dear reader, to find these blogs and perhaps be inspired by what they contain, if you haven’t found them already. Blessings and gratitude to all of the writers, photographers and poets in this list and beyond who share their inner gifts with us all in this wide wonderful world of blogging. It changes with each day! I love purples, blues, greens, reds, but they are all a specific shade not just any old purple, blue, green or red! What is your favorite animal? Dogs and horses, but I love all animals. I also love bird watching – currently we have a nest of sparrows just under our guttering and you can see the baby birds poking out their beaks shouting for food! How cute!! Barley cup, red bush tea or rose lemonade. Oh okay… erm never thought of this before – probably floral – erm not really sure!!! Friday evening – especially if I know I have the full weekend ahead to write! Pfft…. How long have you got…. I love the smell of lilies. I love Lily of the valley because it was my grandma’s favourite. I love daffodils because they remind me of my Mum. I love snowdrops because my Mum lovingly sewed about a zillion onto a dress for me, for a fancy dress competition at school (I didn’t win). I love freesias because they are the first flower I ever fell in love with the scent. I love peonies – deep red – because they remind me of my Dad. So – any of those! Thank you Arjuna http://thewondrousdharma.com/ for nominating me. A big thank you to all the writers, poets and artists out there, keep blogging! I love 8 and I love the smell of lillies, too. :))) Thank you for your sweet kindness. And congratulations on your nomination. You are very deserving. Ah I will check you out! Quality, not quantity and your posts are always quality and worth the wait!